Get the look of high-end marble at a fraction of the price with specially designed porcelain tiles. There are countless ways to use these luxurious and durable tiles in your construction projects. Here are just a few ways that you can impress your customers and put your own personal stamp on every renovation. White cabinets are trending right now, and it appears that this design style will stick around for years to come. A slight shift in the trend has homeowners looking at white wood finishes with grey undertones. Calacata Gold polished porcelain tile is the perfect flooring for this finishing style. The bulk of the tile features a polished white color that reflects light and expands rooms visually. It has movement in the tile with grey and yellow veining that travels throughout the surface. 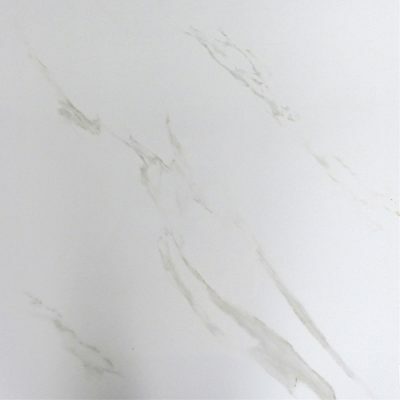 It has a natural look that closely mimics marble, yet it costs a fraction of the price. Install it on the floor, or use it as a backsplash when you redo a kitchen. If you decide to use this elegant material on the backsplash, then you may want to offset it with a deeper color on the floor. This will prevent the area from feeling overwhelmed by shades of white while still making the space seem larger than it is. The grey veining also lends itself beautifully to another hip design trend. While people are moving away from natural shades of oak and maple, they’re embracing mocha and even black finishes. This tile will bring out those deep colors in the wood while balancing out the darker tones. Rectangular tiles are also hot with designers and interior decorators alike. You can find plain white subway tiles at any home improvement stores, but your customers are looking for something a little different. The Alberta Cream Wood look tiles are porcelain creations that closely resemble hardwood floors. They’re an ideal choice for the bathroom because they mimic the beautiful look of wood with the durability and water resistant features of quality porcelain. These can easily be installed on a floor to brighten any small bathroom while creating a luxurious look. They’re an excellent choice for clients who want natural finishes with more durable materials. The cream undertones will work with any style of cabinets, and the rich brown and gold highlights add depth and dimension to the tile planks. A great alternative to marble, they’re easy on the budget and designed to last for years to come in any bathroom. When you want a relaxed but elegant look, go with Alberta Cream wood-look tiles. Basements are moving into the mainstream and becoming less like dungeons. Once relegated to basic storage, basements are now becoming main living areas where people can create home theaters, playrooms, and craft areas. Whether your client is talking about a man cave or just wants a great family room for enjoying movies, it’s important to finish it off with the right materials. One of the challenges with basements is that they’re limited on light. Using soft shades in the floors and colors will help brighten up the space and make it more comfortable. Tiles with a polished finish will help reflect light and spread it around the room. These are both great reasons for using white porcelain tiles that resemble marble. Another challenge with any basement remodel is that your clients may be dealing with a tighter budget. While you can put high-end materials in a kitchen and recoup some of the expense through higher resale values, this isn’t the case with basements. Any basement renovation will generally net a return of about 7 percent, so your clients may not be willing to invest in something like marble for the basement floor. This is where elegant porcelain tiles come into play. The starting price is roughly half that of marble, so you can create the magnificent look while keeping the costs down on materials. Tiles are perfectly suited to basements because they’re waterproof. The concrete subfloor can easily handle the installation with minimal preparation work. Suggest that your clients use area rugs in key areas to help warm up the tiles and absorb noise. The end result will be a fantastic finished basement that feels like an integral part of the living space. Marble looks great in any setting, but your clients may not have the budget that allows for it. When you’re handling renovations in mid-range homes, you may want to stick with materials that look great while being easy on the budget. This helps your clients avoid problems associated with overbuilding a home, but you can maintain your reputation for excellence. Beautiful marble-looking tiles from Nalboor Tiles are a great choice for these renovations. You can achieve the look while keeping the costs down. Choose from a range of white tiles that are crafted to resemble exquisite natural marble. Pittura Snow Polished has a brilliant shine to it, making it a great choice for backsplashes and bathrooms that lack natural light. You can also select a matte finish for a softer look that will work nicely in foyers. Calacata Gray, Gold, and Stone tiles all feature veining that’s very similar to natural marble and sure to impress. These are grand choices for kitchen floors, backsplashes, and even counters. When the look of marble is called for, but the budget just won’t support it, then go with porcelain tiles. In addition to being more affordable, they’re also easier to care for. These tiles can be cleaned with almost any gentle cleanser, or you can just use a steam mop to make them shine again. Available in a range of sizes, they’re the perfect finishing touch for all types of renovations. When your clients are asking for the exquisite look while expressing concerns about the price difference, suggest porcelain tiles from Nalboor. You’ll be able to meet their needs, and they’re going to be thrilled with the results. We are located in the South Florida area and can deliver anywhere in the country and even overseas. Call us today at 305-501-4548 to place your order and have the tiles shipped to your warehouse or directly to the job site.